The 2019 BMW i3 is a revolution in modern automobile manufacturing. With its high-powered lithium-ion battery and sleek design, it strikes the perfect balance of form and function in an electric-powered vehicle. And unlike many electric vehicles, it boasts high performance and a long charge, meaning you can conquer any road behind the wheel of this machine. If you’re looking for a smart and compact vehicle that’s as equipped for city travels as it is for long-distance journeys, this is the vehicle for you. The 2019 BMW i3 is now available at Sterling BMW, the best-rated BMW dealer in OC. Visit us today to find out about our 2019 BMW i3 lease specials! The 2019 BMW i3 features a design unlike any other vehicle. With its compact frame and a futurist aesthetic, it sports a stylish and smart design that is sure to pique the curiosity of passers-by. Despite its small build, the i3 is by no means a cramped vehicle. Thanks to its cavernous design, the 2019 BMW i3 boasts a remarkably spacious interior that can comfortably seat up to 3 passengers. What’s more, it is brimming with tech and convenience features, including automated climate control, heated front seats, and the iDrive 6.5-inch touchscreen multimedia system. And if you need to stay connected to the outside world while you’re on the road, rest assured: BMW’s got you covered. 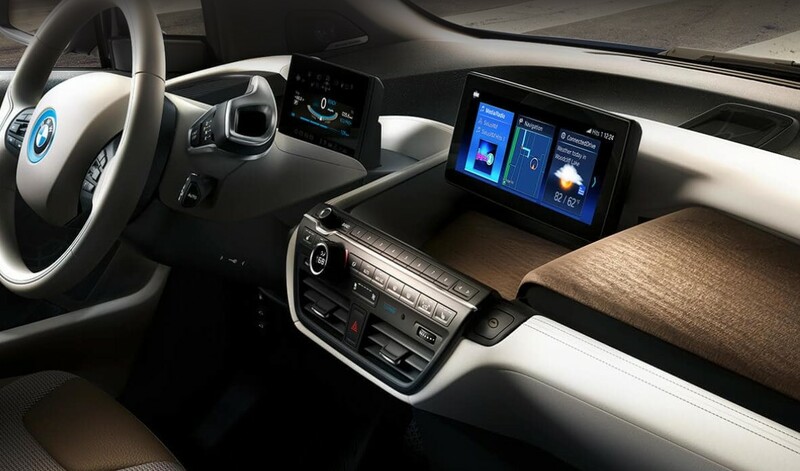 The i3 comes equipped with Bluetooth® and Apple CarPlay compatibility, which lets you integrate the full interface of your smartphone with that of your multimedia system, giving you complete hands-free access to your phone while on the road. No doubt about it: this car was designed with the future in mind. Sterling BMW is the highest-rated BMW center in OC on major review sites. To lease a 2019 BMW i3, visit us today. The 2019 BMW i3 is an exceptional all-around performing vehicle. Equipped with the AC Synchronous Electric Motor, the i3 pumps out a considerable 170 horsepower and 184 pound-feet of torque. The result? An incredibly nimble and quick electric vehicle, going from 0 to 60 in just 8.0 seconds—a rival to some high-performance vehicles. And thanks to its state-of-the-art high-voltage lithium-ion battery, the 2019 i3 can travel further than ever, and fully charge in just 6 hours. At Sterling BMW, we know you’ll love the BMW i3 once you get behind the steering wheel. We offer the best 2019 BMW i3 leases in Orange County, so be sure to visit us, take it for a test drive, and get your 2019 BMW i3 lease today!